I absolutely love Greek food, so when I heard that a new Greek restaurant was opening in my hometown, I jumped at the chance to check it out. Opa! in Avon definitely did not disappoint; I enjoyed both delicious food and great service. The first thing I noticed about Opa was the decor. 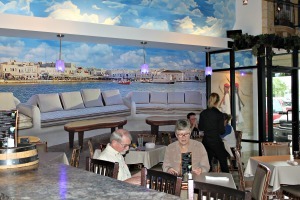 The restaurant has a gorgeous Mediterranean feel with beautiful murals on the walls and stone accents at the bar. Despite being a relatively small space, the restaurant feels spacious, and the atmosphere is relaxed and fun. There&apos;s also outdoor seating available, although rainy weather kept me from taking advantage of it. The main attraction at Opa is the food. The signature appetizer at Opa is the Saganaki, a cheese dish that is set on fire with a shout of "Opa!" before it&apos;s served. It&apos;s delicious, and perfect for sharing. 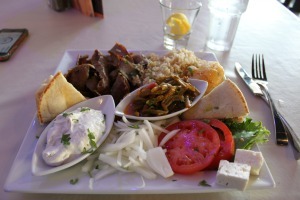 For my main course, I chose the Gyro Platter, and every part of it was tasty and fresh. Opa makes all of their own sauces and dressings (which are amazing), and they import their feta cheese directly from Greece. Opa focuses on authentic ingredients, to give diners an experience that is truly Greek. Two other dishes I was told were very popular were the Youvarilakia (meatballs served with rice), and the spanakopita (savory pastry made with spinach). Prices for entres ranged from $11 to $25. For dessert, I had the baklava, and it was by far the best I&apos;ve ever had. I would love to show you a picture, but I ate it too fast! Opa also offers several unique cocktails, like the Marshmallow Rita and the Ouzo Martini. There are also authentic Greek wines and beers, in addition to a full bar. 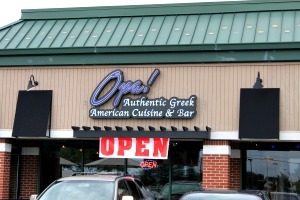 Opa is located in the Avon Crossing plaza, just west of Dan Jones Road. They are open for lunch and dinner, and their menu features options for kids and a few non-Greek items for the picky eaters in your life. I highly recommend checking out this new restaurant; it&apos;s sure to become one of your favorites!